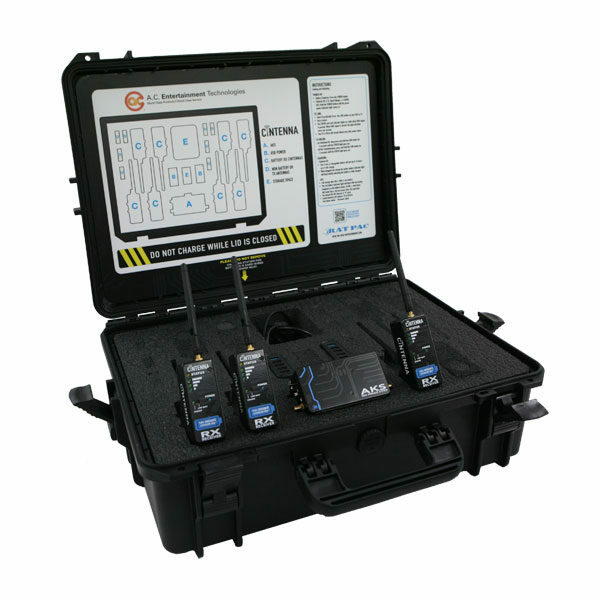 The RatPac kit available from AC-ET has been designed to meet the needs of a wide range of users and lighting systems. The kit has all essential components to hit the ground running on jobs. 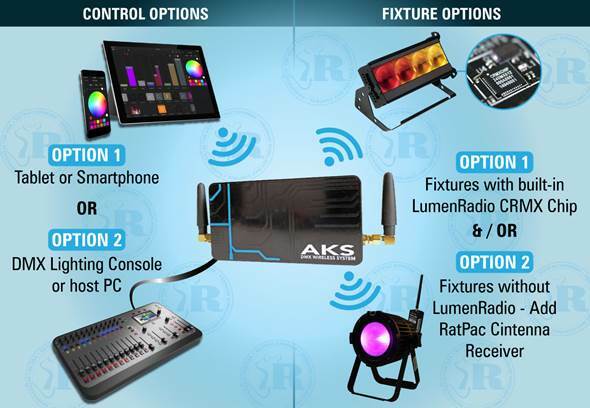 RatPac’s easy to use wireless lighting control kit enables you to control your fixtures from a tablet / smartphone / PC or through a lighting desk. Seamlessly control fixtures with LumenRadio’s award-winning CRMX wireless DMX on-board, as well as those with only wired DMX capability. The RatPac AKS is small enough to fit in your hand but has a powerful router, a LumenRadio CRMX transmitter, and a DMX node all in one. With over 20 hours of battery on just a single 5 hour charge time, you will always be ready. LumenRadio’s award-winning wireless technology gives the AKS over 1,200 feet of range to the lights, and uses 128 bit encryption and error correction to ensure a clear signal no matter what. Long range Wi-Fi allows your tablet or phone to control the AKS from up to 250 feet away, and the Ethernet port interfaces with most modern consoles and PC-based DMX software. The included L2-Net Ethernet cable allows iOS devices with Luminair 3 software to work with the AKS even if the Wi-Fi environment is saturated. For lighting devices which don’t feature built-in LumenRadio CRMX technology, RatPac’s Cintenna receiver features wireless transmitter and receiver adaptors, plus a RatPac AKS. The Cintenna RX receiver plugs directly into the back of lighting fixtures themselves and requires no extra rigging hardware. It uses LumenRadio’s award-winning wireless technology with 2.4GHz intelligent band hopping, features a 270 degree swivel rotation, and is RDM compatible with a LumenRadio Nova FX or TX2. Adaptors are available for nearly every DC power source, from 4 pin XLR to USB. Power the receiver directly off a light. 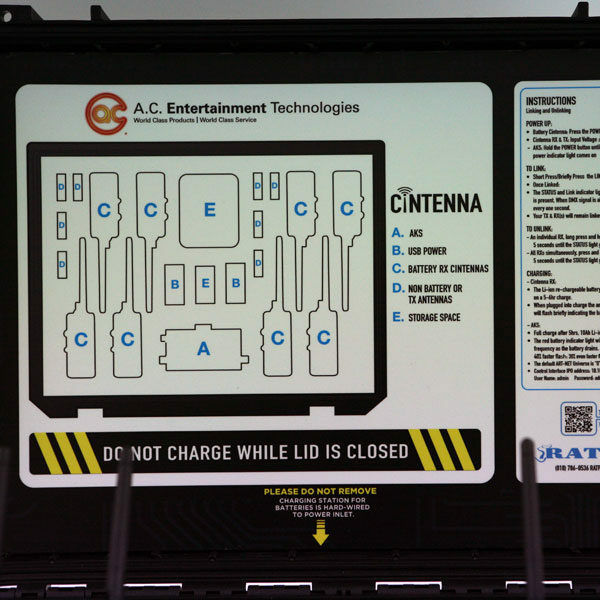 A QR code on the Cintenna takes the customer to DMX wireless setup diagrams. The Cintenna is now available with an optional rechargeable 14 hour lithium ion battery, as well as the standard built-in battery. Both fully charge in 5 hours. 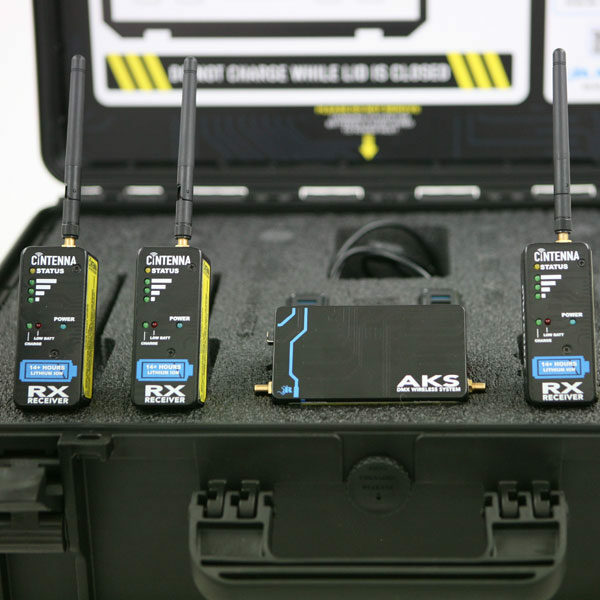 AKS DMX Wireless System (one universe) IN803509-A.K.S.